Found this bottle at a lake. Brown, has the federal law forbids sentence on it, so i know it was probably made between 1930 and 1960's. The side say Philadelphia.,,famous since 1894. Bottom has D-90...43.....49.....8. Can anyone help me figure out the age and value. The 43 and 49 markings may suggest a 1940s manufacture, but the FEDERAL LAW FORBIDS embossing does, as you state, put the age in a ~30 year bracket. 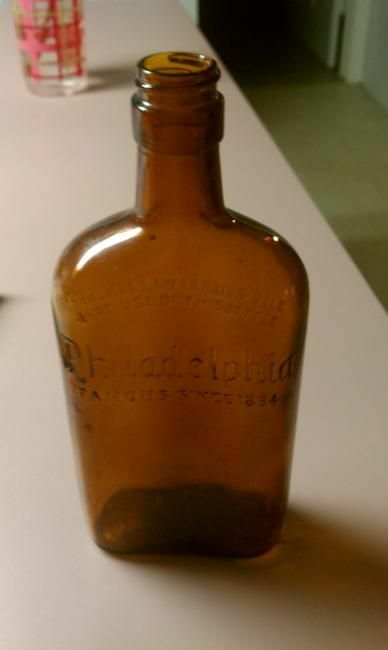 Value for 20th century bottles like this hinges on original condition with label - contents helps too - without these extras, this is a common bottle with little or no demand. Browse ebay using the search string "Federal Law Forbids" to get an idea of what is being offered and what is selling / not selling.